Edward Hopper was born on July 22 1882 in Upper Nyack, New York. This was a small yacht building community on the Hudson River just north of New York City, and is evident in many of his early works. He was one of two children of a pretty well to do family of the time, his father was a successful dry goods merchant. While Hopper was best known for his amazing oil paintings, he was also very skilled as a watercolorist and printmaker in etching. His works range from urban scenes of bridges and boats and his vast rural paintings truly reflect his own personal vision of modern American life. Hopper started his art studies in 1899 and soon transferred to the New York School of Art and Design where he had the pleasure of studying under French master etchers Edward Manet and Edgar Degas, and the artist Robert Henri taught Hopper a Life class.One of Hopper’s first oil paintings that hinted at his brilliance is Solitary Figure in a theater and his first official sold painting Sailing in 1909. 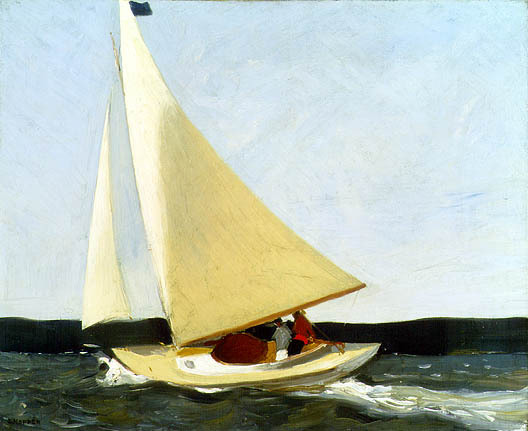 Hopper would meet his future wife Josephine Nivison in 1923 during a summer painting trip, and marry 1 year later. She was his opposite, but the two spent their lives happily together, splitting their time between their New York City Apartment and Cape Cod. Edward was a very productive artists throughout the 1930’s and 1940’s creating works like the Cobb’s Barns and Burly Cobbs house, both added by the Obama Administration to the Oval Office in 2014. Hopper past away on May 15th 1967, and his wife past away 10 months later, donating all their collection of over 3000 works to the Whitney Museum of American Art. The picture above Sailing, is his first officially sold work. Enjoy the beautiful weather and local art and food from the Bay Area and beyond at Alameda’s 33rd annual Art and Wine Faire in downtown Alameda July 29th and July 30th. This free family friendly event features over 300 arts, crafts and food vendors, regional craft beer and local wine, a special kids area, and live music on two stages. The festival is open on Saturday and Sunday from 10am-6pm. Located in the vibrant historic commercial district right in the heart of Alameda, there is sure to be fun for all! With local restaurants offering specials and tastings, a kids zone with carnival rides, games and more, and two stages with great diverse music playing throughout the two days of fun. The Downtown Alameda Art & Wine Faire is always free to the public, and for those who would like to ride bikes, there is a secure parking area for your convenience. For more information, call (510) 523-1392 or visit the website here. Week 6 of summer camp is a fun week including a field trip to the Palace of Fine Arts, where we take in the history of the museum still standing from the early 1900’s and its beautiful round dome. We set our easels in the park and let the reflections of the architecture reflects on the lagoon, and let our imaginations come to canvas. Week 7 of summer camp is all about uncovering the secrets and mysteries of the famous Winchester Mystery House. From the staircases that go no where and the twisted hallways that leave visitors dizzy and wondering, this a must attend class for those who love history and mystery combined. Join us as we paint homes from the past and a time that once was. Art Attack is a fun and interactive art studio in the SF Bay Area that provides instruction in the fine arts to children, teens and adults. Art Attack offers affordable painting classes year round to the residents of the San Francisco Bay Area. We have art classes for kids ages 5 and up with after school and weekend classes, as well as teen and adult art classes Monday through Saturday. Looking for a place to have a fun and unique party? Art Attack Burlingame also has Arty Parties which are perfect for any occasion: birthdays, showers, girl’s night out and even office team building!